My guest this week is my charming niece Pooja. Young, energetic, caring and always smiling. Pooja loves helping people, it just comes very naturally to her. Born in Kenya, partially brought up in Kenya and then in US, she is pretty much a very down to earth sort of girl. She would come to spend her holidays in Mombasa when she was very young. She loved to be around my mother in law or me when we worked in the kitchen.It seemed that she was observing how we were preparing the food. Trips to the beach was like an ultimate dream come true for her. She simply loved the sand and the sea. I remember as a toddler she was not a fussy eater and loved exploring her environment. After they moved to US, we were not able to spend much time together but keep in touch through emails, phone calls and messages. Recently she attended my daughter’s, it was like my second daughter arriving. Any job that needed any attention I just dropped it in her lap and she took care of it. A pharmacist by qualification, she enjoys painting, reading, watching movies and going for concerts. 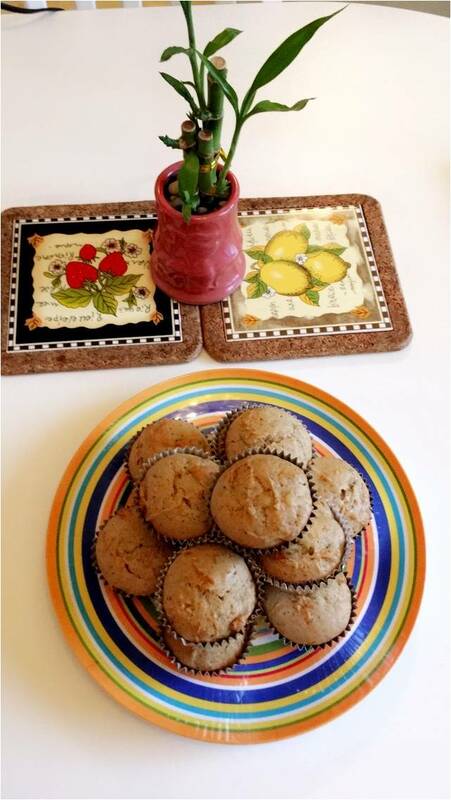 Pooja decided to share her eggless zucchini bread muffins. Over to Pooja. When Mayuri mami asked us to prepare a recipe for her blog, I was kind of stumped as to where to start. After browsing through many ideas, I finally decided on baking something sweet. As she has mentioned many times in her blog, our family has quite a sweet tooth.And if I may say so, she’s partly the reason behind it. If I remember correctly, most if not all of my summer vacations were spent in Mombasa with mami and rest of the family.Mami would spend hours in the kitchen whipping up dishes and still would have the energy to take all 5 of us cousins to the beach almost every single day. I would always look forward to her desserts most of all. Now that the family is literally spread all across the world, those memories are very precious to me as we hardly get to see one another. After moving away from home, her blog has tremendously helped me when it comes to cooking. I don’t have to call mom anymore when it comes to recipes. Even when I do call mom, her response usually is “why don’t you check on Mayuri’s jikoni”. This recipe makes about 25 to 30 muffins. Combine all the dry ingredients (flour, baking powder, baking soda, cinnamon, nutmeg, and salt) in a larger mixing bowl. In a separate bowl, whisk together the oil, sugar, yogurt, and vanilla extract. Mix the grated zucchini, carrots, and chopped walnuts. Line a muffin tray with muffin liners or grease the tray with butter. Use an ice-cream scoop to fill the liners about ¾ of the way full. The muffins are best served warm with the cinnamon butter spread. Tip: I did not squeeze out the excess water from the zucchini as this adds moisture to the muffins. I love this eggless recipe for muffins. The cinnamon butter topping sounds amazing too. What a lovely series to get family to guest post, the muffins sound super delicious and tasty.Looking forward to future guest posts. Thanks Mina. I too like the cinnamon butter topping.